Celebrate Asian Heritage month in May. 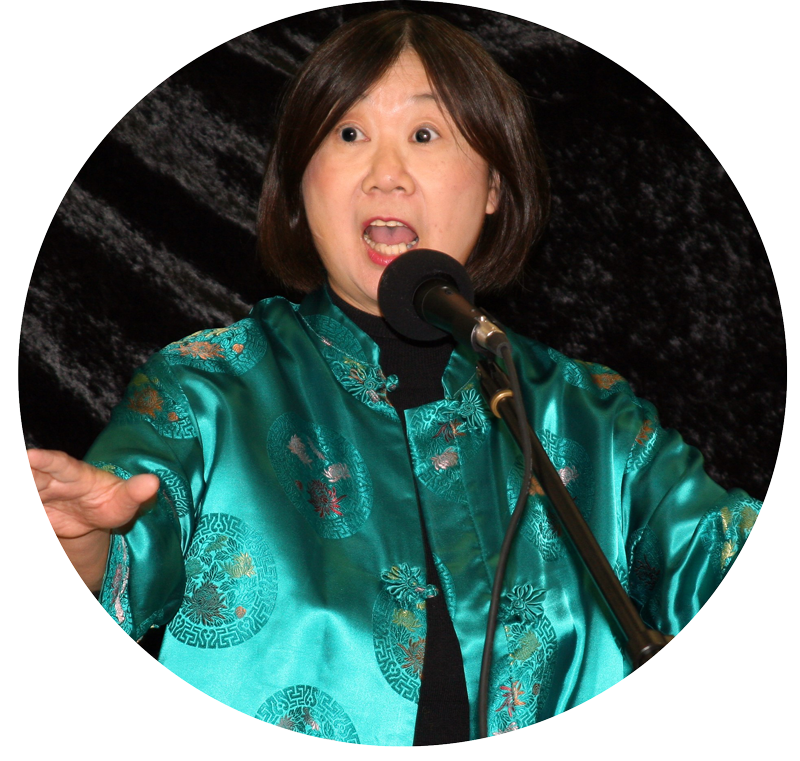 As an experienced performer, Bernice is happy to tailor the presentation to the interest of each school group. She paces the presentation for active engagement. The youngest love to stomp & holler as the magic unfolds. She brings maps & artifacts. Older students hold a silk cocoon or iron spike. Bernice tells of the ancient silk trade route and the building of the Canadian Pacific Railway. What language are children speaking at home? Chinese words are pictograms. Bernice paints 金 山 for Gold Mountain, named in the 1850’s gold rush in the Fraser River valley. Gold mountain stories tell of the head tax and the struggle for the rights of full citizenship. Bernice pauses for Q & A. At the closing, a child may write his/her name in Arabic, Urdu, Greek or Korean on the paper scroll. Kindergarten presentations are 45 min. whereas grade 1-3 are 50 min. and grade 4-12 are 60 minutes. Bernice retells folktales. “The Magic Paint Brush” enchants all ages. Her version of “Rich Man, Poor Man” has the audience deciding if the shade of a tree can be bought or sold. She tells the “Moon Calendar” with 12 animal painting. “Lon Po Po” and “Yen Shen” have European versions. Bernice loves history, she tells how Empress LiShi discovered silk and General Hsin invented the kite. She tells stories by Canadian author Paul Yee; “Ghost Train” recalls the perils of building the transcontinental railway. To teach children a Chinese word, Bernice created “Leung Leung” a dragon sounding word told with movement patterns. Her social justice stories include: “Mr. Yip’s Laundry”, WWII soldiers come home to fight for the right to vote and “BaBa’s Blue Shirt”, elders break their silence when a grandchild finds head tax papers in the pocket of a faded blue shirt. For a century, Chinese communities in North America were bachelor societies. The end of Chinese Exclusion meant that Bernice saw children bigger than herself, some as tall as their father being reuniting in Toronto’s Chinatown. Bernice loved words and pictures and so after school Chinese classes was fun for her. “Not so” said her brother who played hooky for hockey. Her parents saved for a house. At her new school, the only visible faces were her siblings. At home, Grandma told tales of emperors, dragons and village orphans. Bernice studied art history at university. She performed in theatre and co-hosted a national CBC radio program. Bernice is a visual and performing artist who loves working with children. For 30 years, she has been creating classroom art projects (K to grade 8). As painted dragons, kites and lanterns dry on desks, Bernice tells a tale or two. Concurrently, since 1995 Bernice has been performing in libraries, cultural centers and festival events across Canada as well as internationally. She has led workshops for teachers at various boards of education in Ontario as well as for the staff of Citizenship & Immigration Canada. Bernice has been a guest speaker for the Multicultural History Society of Ontario and the Canadian Museum of Immigration – Pier 21 in Halifax. Visit Storytellers of Canada and Authors’ Booking Service for more information. —Jill Ogilvie, Teacher-Librarian, Britannia P.S. —Donna Smith, Teacher librarian, Seneca Hill P.S.